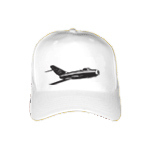 Mig 15 Russian Aircraft Cap. Our adjustable, 100% brushed cotton Cap is unstructured and an ideal way to beat the heat. Wear it anytime you want to keep the sun off or cover up a bad hair day. Cap has multisizes catcher. You will not have problem with size of cap. Here is your cap.